If you are experiencing roof leaks, roof noise, broken roof tiles or an unsightly roof, you may be in the market for a roof restoration for your property. While roof repairs and restorations can be purely cosmetic they can also be essential to ensure your home is completely water tight and safe for the inhabitants of your home or commercial property. Roof restoration is the process that is performed by professional roof restorers or roofing contractors to identify and fix problems, leaks and areas of your roof that could cause long term damage to your home. Experience has shown that allowing your roof to go through a long period of damage may result in you needing a full roof replacement. Undertaking a roof restoration can, in the long run, save you a great deal of money and add tremendous value to your home because you are extending the life of the roof and avoiding costly repairs in the long term. You’re probably well aware that an old and tired roof can cause a poor first impression and if you are looking to resell your property an attractive roof and exterior could do wonders for resale and attracting buyers. 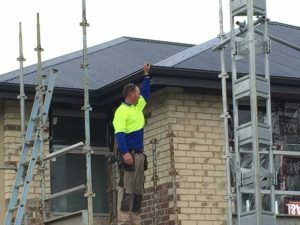 If you’re looking to undertake a roof restoration project, or you’re interested in finding out roof restoration costs, it’s important to be aware of a how to find the right roofing contractors, the types of roof restorations available and areas you can save when undertaking a roof restoration. In this article, we share valuable information on roof restoration costs and how you can ensure you get the best value when undertaking roofing repairs or restoration for your home or commercial property. What costs should you be aware of when restoring a roof? When you have a worn out or old roof and you are considering roof restoration it’s important to know what costs you’ll be up for and a ballpark figure for a restoration. In most cases, it can be anyone’s guess just how much a roof restoration will cost and understanding what is involved and what the job will cover will allow property owners to understand whether they are getting value for money. As a basic service, your roof restoration may involve the cleaning of dirt, mould and any other surface grime that has been growing on your roof for any length of time. If you live in a moist or tropical area, you might have mould or algae on your roof or if you are in a bushy area with plenty of trees you might have a wide range of organic materials on the roof that needs to be cleared and cleaned away to reveal your roofing material. It’s important to have any broken tiles replaced or realigned during the roof restoration process or if you have Colorbond and need sheets replaced, these can be replaced during the roof restoration process. Matching the tiles can be difficult and expensive if they are from decades ago, so this cost will need to be discussed ahead of the restoration process. Your professional roof restorer will run you through replacement and how to manage this process so that your roof looks good and mismatching tiles or materials are kept to a minimum. Painting your roof is a great way to restore and freshen up the exterior of your house and to match the exterior of your home in modern colour palates. If you are looking to sell your house and your roof is in otherwise good condition, this can be a simple and effective way to make an instant first impression and brighten up your property to prospective buyers. Roof painting can make an instant impact on your roof and adds a fresh and new finish to your property that will be embraced by property investors. Installing a whirly bird is a quick and simple way to boost ventilation within the property and avoid any issues with mould and poor circulation. Installation is fast, and the results are instant. Restoring a roof can be expensive, and if you are looking to undertake a roof restoration you’ll probably want a ball park figure so you can save or budget for trades and roof repairers to come and work on your property. It is difficult to give accurate cost estimates without a thorough inspection, so if you are looking to get a quote ensure your roof restoration company takes the time to get onto your roof and do a close inspection. The repairers should take photos to show you before and after shots and to allow you to make an informed decision based on the restoration work that needs to be undertaken. Roof restoration can be anything up to $10,000 for some jobs, so whether you need minor work such as gutter cleaning or a complete roof resprayed, ensure you engage a roofing contractor that is transparent and clearly outlines all of the services and their individual costs. Ask contractors to include the costs for cleaning and preparation, paint including secondary and primary costs and always ensure they are licenced and insured ahead of doing any work. The roof size, pitch and also the type of roof will affect the cost of the roof restoration so be aware that while your neighbour or friend’s home could have cost a certain amount, the cost of roof restoration is based on the individual house or commercial property and every property is unique. There are a few common types of roofing in Australia, which means that when you’re looking to cost out a roof restoration project, you will need to be aware of what type of roof you have on your property. These are probably one of the most popular types of roof tiles and the last for approximately 50 years when on a property. The tiles are resistant to salt so a great option for coastal homes and work to offer great thermal protection. There are plenty of options when it comes to the colours of terracotta tiles and some tiles can be tedious to replace. Be aware that the tiles can break when hit by solid objects, so you might need to have a few spare tiles in your garage in case you ever need to replace tiles. Steel roofing is another particularly popular option for modern homes and one that is gaining popularity due to its energy efficiency such as the massive saving on heating and cooling costs. While a steel roof can be noisier than a terracotta or concrete roof tile, many find the sound of rain on a steel roof particularly enjoyable and the material is a popular one in many new homes. Concrete tiles will last up to 40 years on a home and have a nice, flat profile making them another popular option for property roof tiles. The concrete roof tile is resistant to fire and is also strong. The one drawback about these types of roofing material is the weight and the difficulty of installation. What ever type of roof you have installed, if it looks tired and worn out or you do need to fix your roof to ensure your home is properly sealed and weather tight exploring the idea of a roof restoration is a great way to preserve the life of your roof and give it some TLC in lieu of doing a full roof replacement. Whether you need to repoint your ridge caps on your roof, stop moisture from getting into your home, need a roof clean, or you want to improve the general look of your home or commercial property, a roof restoration is a quick and easy way to improve your property without the cost of an expensive roof replacement. If you’re in the market for roof restoration and you are costing out the pros and cons of the process, it’s important to do your research and ask around for recommendations for local roof restoration companies that are licenced and qualified to undertake roof restorations. Using quality materials, engaging a company with a written roof restoration warranty and ensuring the work is done by professional roof restoration experts will provide the peace of mind that your roof restoration will stand the test of time.